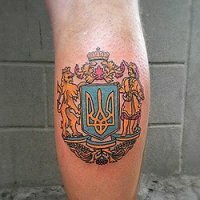 Visit our tattoo shop in Kiev. This is a comfortable lounge-tattoo in the center of Kiev Pechersk, for applying artistic tattoos that meets the highest requirements. Term "tattoo" has a broad meaning, it is not just a permanent image on the body, it is form of art, fashion, style and personality. Our salon pays special attention to the beauty of the human body, so here you get a real aesthetic pleasure, which will remain in memory and on your body. 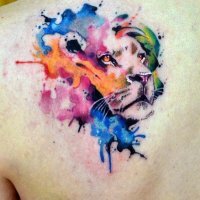 Our tattoo studio master tattoo work with special education and years of practice. 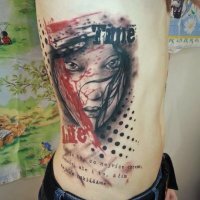 We can make you a tattoo for every taste and convert your old tattoo is sick, or have you are not satisfied. 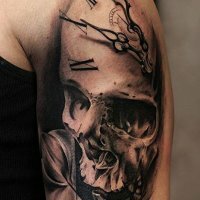 Here you can select a ready-made tattoo design in different styles and to order an individual to develop a sketch. 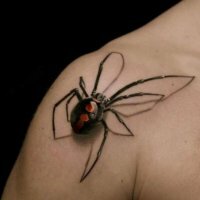 Our tattoo parlor tattoo applied on the latest technologies with modern equipment from the best manufacturers. Supplies and equipment are sanitary certificates and quality certificates. Make a tattoo in our salon are absolutely safe. All procedures are carried out in complete sterility. All supplies are disposable and decompressed to the client. This ensures the safety of your health and quick healing tattoo. We offer fulfillment for lovers of tattoos and inseparable friends and girlfriends. tattoo in our studio, in a warm and friendly atmosphere, our specialists will advise you in detail and help you in choosing the most tattoos and place of application, and will answer all your questions. Our tattoo masters help to reveal the inner world of each person. Tattoo is a challenge mediocrity and dullness of everyday life, which gives its owner the determination and toughness, or grace and beauty. Tattooing is a way of life, expressed in the human body! What do you think it possible to completely remove a tattoo? If not - then you are among those 90% who do not believe that the tattoo removed at all possible. 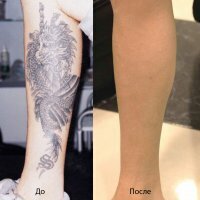 And there is nothing surprising, since the only technology that allows you to remove a tattoo - it's laser technology. 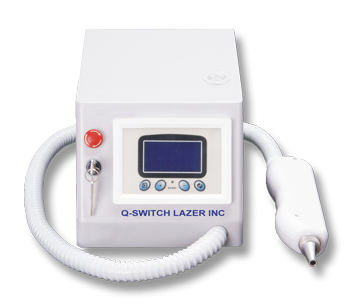 Traceless method of tattoo removal was invented only a few years ago, people just do not know about it. Gift certificate for tattoo and permanent makeup. In our showroom you can buy beautiful and stylish gift that will be on memory for a lifetime. This is a generic certificate denominations 300, 400, 500, 600, 1000 USD ., As well as gift certificates, without par value - for any amount paid. With the help of which you can make the dreams of people close to you. Certificates are always available and you can buy them any day of the week, and before use, be sure sign up for a day or two please call to schedule a convenient time for you! Our adress: Kyiv, Pechersk, Letniaya str. 25. Check with the Laboratory lane.